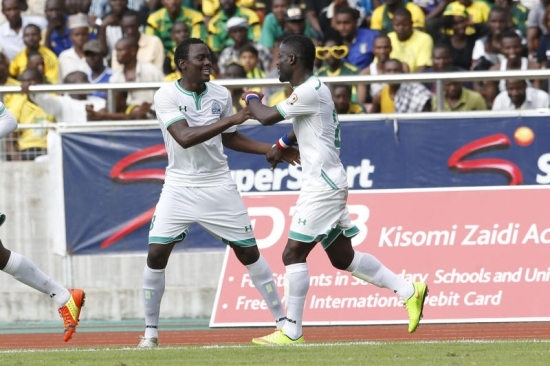 Gor Mahia opened their 2015 CECAFA club cup campaign with a solid 2-1 win over Young Africans of Tanzania. This is unlike last time when Gor Mahia started by not only losing to KCCA of Uganda but were comprehensively outplayed. This time Gor Mahia were in the driving seat. It was Yanga who took an early lead due to an unfortunate error by Gor Mahia central defender Dirkir Glay : Glay had attempted to clear a dangerous cross from winger Donald Ngoma, but his mis-timed clearance ended up sending the ball over goalkeeper Boniface Oluoch. Gor Mahia equalized in the 18th minute from a freekick. The freekick resulted when Godfrey Walusimbi was fouled. Karim Nigiziyimana sent one of his inch perfect deliveries into the danger area and Haron Shakava headed past Ali Mustafa in the Yanga goal. The towering Shakava is quickly joining the ranks of other Gor Mahia heading legends like George Otieno “Vigo”, Allan Odhiambo and of course Peter Dawo. 5 minutes later, Zambia winger Ngoma received a second yellow card for attacking Shakava, and he was sent off as Gor Mahia and Simba fans cheered. Simba fans were actively chanting “Gor Biro”. This raised Gor Mahia’s morale and they dominated the exchanges with far more attempts on goal. At minute 32, a wide open Olunga controlled the ball well but sent his shot over the bar, thus missing a glorious opportunity. 5 minutes later, a the dangerous Olunga was felled by a Yanga defender but the referee waved play on thus denying Gor Mahia what should have been a penalty. Michael Olunga who had been active all day saw his efforts rewarded when he scored the second goal soon after the start of the second half. Godfrey Walusimbi also found himself in the referees book when he was cautioned for a foul in the 62nd minute. In the 73rd minute, Boniface Oluoch became a hero when he saved a penalty from veteran Kelvin Yondani. Congratulations to Gor Mahia for opening CECAFA with a win over the dreaded Tanzania power house, Yanga. Gor played so well today, Yanga played well nut rough game. You have done us proud, our Gor Kogalo. Thanks for maintaining unbeaten record home and abroad. Thank to coach Frank Nattal for great coaching, the days of Coach Julians is back. Finally, thank to suppress who went to cheer our national team in Tanzania, the likes of Hair Soldier. Let us all thank the thousands of Simba suports who came in large number to cheer for Gor, all were chanting Gor Biro. Their voices actually muted the ones for Yanga Fans. Thank you Simba Fans for increasing the morale of our players. We felt like we were playing at home. Above all, I thank God for thus victory, I pray that he guide our players to lift the trophy. Good game….truth be told we won 3-0 as all goals were scored by kogallo. Shakava,aucho, olunga and oluoch simply world class. So much for kubebwa na marefa. Did AFC fans, M.muiruri n K.Kenyatta watch this match? Tulikuwa na kazi moja tu, tulikuwa na kazi moja. Kazi ilikuwa ni kumpiga Myanga. Congratulations team. Yanga are still young Africans and therefore have not come of age to play against mature adult Africans in the name of K’Ogalo. I return all the glory and honour to the Almighty God for this sweet victory over stubborn Yanga in the mighty name of Jesus Christ Amen. On behalf of the Pwani fans, I would like to congratulate the players, technical bench, our traveling fans, Simba fans and executive committee led by Ambrose Rachier for the great work. You all made us proud. Kudos Gor Mahia is very versatile these days alternating between the attractive passing play and direct football with ease. Efficient & effective football that managed to check the equally skillful Yanga. Quite a joy to watch. My oh my what a crowd. Kudos to the team for the job well done. Keep it up. Btw where are the Kogalo haters? Hata maref wa cecafa wantufavour? Tusishereke sana majama. Manake Gor hakumshinda Yanga Kiume. Gor walikuwa na wachezaji 11 dhidi ya wachezaji 10 wa Yanga kwa dakika Sabwini. Why play with five defenders yet u hve plenty of midfielders to choose from.i think nattal was abit coward and we did not even press the way we do in kpl.congrat for the win but the game was boring.olunga is a future world class player.we could hv los if not for the red card. Compressor, you are always contrarian in your posting. Why can’t you apply for coaching job at Sony since you always think of your misplaced formation and ego? Just shut up with your biased and negative comments on our excellent coach. @Ingo, Gor Mahia equalized when Yanga had their eleven players. Stop posting your cramps in this site and may be you can try in Ingwe site. Those that do not know football do not know that a ten can even perform better with ten players as extra energy and adrenaline is added to the team. Please check your comments and consult far and wide. Do research and read more as knowledge is power. I meant, “Those that do not know football do not know that any team with lesser players can even perform better as compared to a team with ten players as extra energy and adrenaline is added to the team with lesser players. @ Compressor I hear you but beg to differ, Nuttal is proving to be a shrewd/tactical coach, not a coward, playing to his team’s strenghts as per the players available for the game. The kind of fluid pressing game we so much cherish needs more “higher” quality midfielders like Aucho something which TB must seriously consider in the next transfer window. But my friend get ready to sort out the wage bill/transfer fee coz acquiring & retaining such talent ain’t cheap. @compressor, give us a break. You have your AFC site to comment on. You are a true Zebra blue masquerading as a Gor fan.The coaching job at Gor was vacant and you didn’t apply for the job. Please help Loga, Ingo and Bill Wabz to rebuild Ingwe. By the way I haven’t checked the table of the KPL second tier league:How many points does your team have? I hear you are in top 5 but with how many points? Numbers can lie. Figures don’t. Baba Travis, you have made my day that numbers can lie but figures do not. This is the naked truth. Also the blue zebras should note that playing against ten men might look easy but there is a physiological element attached to the whole situation. Further more we equalized when Yanga had eleven men. Let us see how the Blue Zebra fairs on today against City Stars who are likely to be reduced to 10 men. (1) we collected 3 points from a host team in front of millions of their fans and (2) we won our opening match. This win does a lot for impetus and momentum. Obviously our win is a big disappointment to Ingo and Dennis Odhiambo, however, we don’t care. That win is important because it helps settle the team down, thereby making more fluid trademark performance almost a guarantee in our next matches. Expect a much better performance from Innocent Wafula, Glay and the AMOK system. Expect a more confident and cohesive defense. Expect a more purposeful and fluid game. Expect more wins with higher number of goals. Ingo I am sorry, but please not that Yanga being reduced to 10 men was as a result of the presence of Gor Mahia in the field…and not just presence, but presence with a lot of pressure. Kindly do not start blaming us for the red card. Once more you have conveniently chosen not to comment on the penalty awarded for a ball-to-hand incident. In case you are in doubt please check where Shakava’s arms were: at his back, out of the ball’s way. Why are you not complaining about a naive, overzealous referee? Welcome back Oduor12. Your company in the blog just adds to my good news this weekend. Now the team will perform even better! @BB erokamo. and just to add Yanga didn’t even score but were gifted an own goal. Secondly twas none other than Shakava usually a defender but slotted in midfield who scored Pushing the argument further isn’t Walusimbi also a “defender”, not forgetting that Aucho hit the post. So many ifs & buts but the bottom line is Kogalo 2 Yanga 1. @Barefootedshifta, I have visited the site and it is hilarious seeing ingo cry. This is shame to the masculine species. Men shouldn’t cry in public. On a lighter note I think this guy is very passionate. Ask Rachel Shebesh and you will get the full weight of what am saying. Our local Secondary School need a Kiswahili teacher.Ask him to get in touch. Am the BoG chair. I will help him get that job. Good morning wall,haaaa….long time i can see the ingo guy is still around with his negative energy,how is jakoyo??? Am back ni hali ya kutafuta…following.